Speaking of Women's Rights: Just Stop It. That’s what runs through my mind as I ponder the ill-fortunes of various sports stars. When the Tiger Woods* scandal first broke and people obsessed about it, there was also some push-back: leave the guy alone, he’s just an athlete, people mess up, etc. But I couldn’t help flashing back to Kobe Bryant* and the outrage sports fans (including in my own natal family) expressed that he should be accused of, much less held accountable for, vicious, sexist behavior. And now there’s Ben Roethlisberger*, who has just been suspended for six games (maybe; could be cut to four) for the second allegation of sexual assault in the last two years. Mind you, he was suspended for violating the NFL’s code of conduct, and he hasn’t been charged with a crime (yet. Though perhaps he never will be.) Innocent until proven guilty: I get it. Stick with me. First, let’s pause to say “awwww, we’re so sorry, Mr. Roethlisberger, that you might lose money because you’re not allowed to play some games.” After all, I am sure you are worth $12.75 million per year. And making you forfeit $4.78 million just because you violated the player’s code of conduct does seem a bit harsh. But don’t worry: like Tiger, Kobe, and other sports stars accused or convicted of crimes (e.g., Michael Vick*, Plaxico Burress*), your bank account won’t suffer that much. You’ve got Nike in your corner. 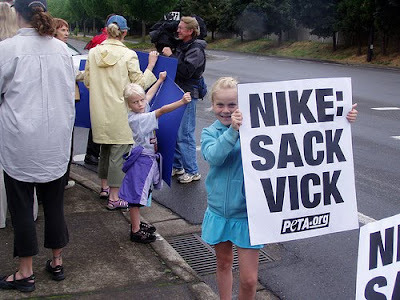 And come hell, high water, felony convictions or bad publicity, chances are Nike will stick with you, as it did for the others. A sports hero and a role model sells shoes, after all, no matter what heinous activities he engages in. It’s not just the money. Nor is it simply what all this says about sports, our society, and who we look up to and reward. It’s about how we view women. Timothy Egan is more eloquent on this subject than I, and he gets it right. An additional element to consider, though, is what each of these crimes is, and what they mean for the role and perception of women in our society. The majority of these crimes and actions are against women or indicate a profound disrespect for women. And even those that may not seem so are troubling signals about the value of women: abusing animals is a common precursor to or indication of domestic violence and battering, while the number of women shot and killed by their partners seems on a perpetual upward trend. Equally disturbing, or perhaps just more blunt, is how Nike itself treats women, which is really a reflection of the greater society. Yes, Nike has programs for women’s sports, it has women endorsers (gosh, isn’t Maria Sharapova beautiful? Can someone remind me if Martina Navratilova had a Nike deal? ), it gives some money to girls’ sports programs. But just look at Nike’s website: If you go to its homepage you can choose among (in descending order) Basketball, Football, Golf, LIVESTRONG . . . Soccer and Women. I don’t want to hear about how these are in alphabetical order. Until we stop making women’s sports (and women’s accomplishments, and women’s intelligence, and women’s interests) a ‘special category’, we can’t begin to eradicate violence against women, move toward paying women what they’re worth, or allow women to realize their potential. Too bad Nike just doesn’t get it.